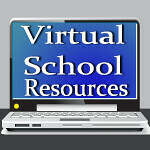 Virtual School Resources: I can play games all day? Don't mislead your child into thinking that virtual schooling is all fun and games. It can be fun, and there are games, but it is not all fun and games, any way you look at it. Virtual Schooling is hard work. Most online schools give students the opportunity to enroll in advanced and honors classes. If you get that chance, take it! You will usually have time to change your mind if it's too difficult. But don't let your child take the easy road. Life is not easy, so teach them that along the way. These years of education will be over before you know it. Take full advantage of every learning opportunity!